If you’re a marketer with more than 10 years of experience, you’d be forgiven for feeling a bit dizzy. I cobbled together data from a couple of sources to build a chart that illustrates some real upheaval. 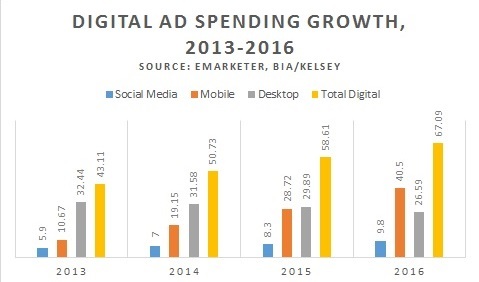 It shows information from eMarketer and BIA/Kelsey on total spending in digital, along with mobile, desktop and social-specific amounts. I bet there aren’t many four year periods in the history of media that are as substantial in their total spend and yet subject to so much change. In just four years, mobile advertising should quadruple and overtake desktop spending. Social media spending will increase by about 50 percent. It would be fantastic if you could get ahead of the curve for once. The good news is that the mobile marketing landscape is signaling a change that gives you a shot at doing just that. I’m talking about the emergence of mobile messaging apps. The most popular ones include Line, WhatsApp, WeChat, Facebook Messenger, and Kik. Together, the top 10 most popular apps in this category attract 3 billion active users a month. At Facebook’s F8 developer conference last week, the company revealed that WhatsApp has 700 million monthly active users, while its Messenger app has 600 million. These apps exist exclusively for mobile phones, which means WhatsApp and Messenger have about as many mobile users as Facebook had just three years ago. That sort of scale makes the messaging category a fertile space for marketers. Messaging apps in Asia already do a lot more than just process messages. They distribute games and support e-commerce companies. 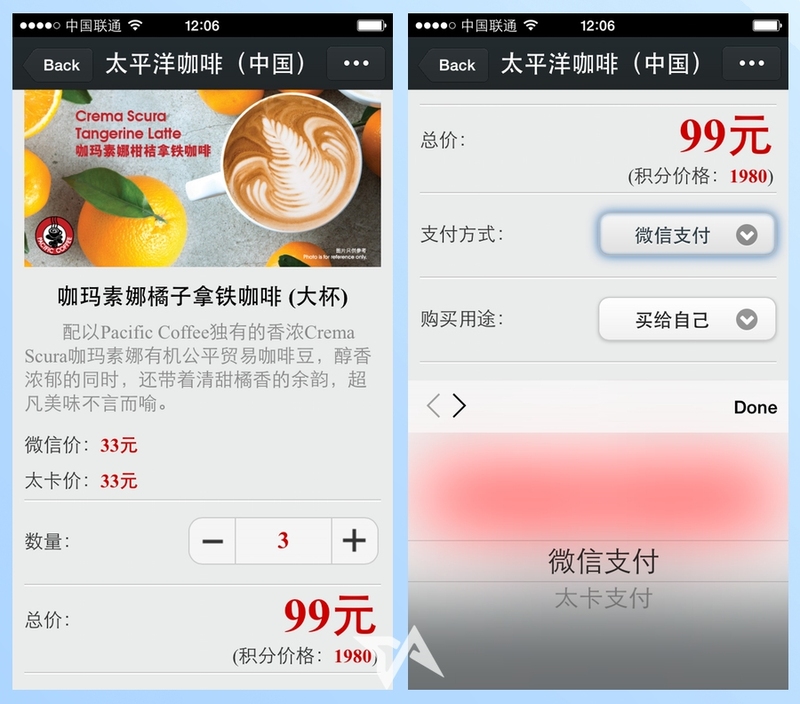 Here’s a screenshot of WeChat enabling the sale of coffee via a pre-paid account. The image comes from this article, which includes more information on the app’s diverse functionality. Facebook Messenger already allows users to exchange messages, photos and even money. At F8, Facebook CEO Mark Zuckerberg revealed how the company will turn Messenger into a platform of its own. Developers will be able to create apps that run on Messenger. Companies will be able to establish customer service operations on Messenger, making it possible for them to respond to customer questions or complaints. To get started, determine how many of your customers use these messaging apps and in what ways. Partner with agencies that know the social and mobile space well to develop a marketing strategy and be prepared to experiment. Involve the office of the CIO or CTO as you explore. Not everyone thinks that Facebook Messenger will succeed as a standalone platform. While that prediction may turn out right, I think it’s more likely that Facebook Messenger, like its Asian competitors, will become a new avenue for app distribution, advertising and e-commerce. Though marketing via messaging is in its infancy, it should succeed for the same reasons that Facebook, Twitter, LinkedIn and others have: an elegant user experience that attracts massive amounts of consumers and produces even more consumer data. The result should be a new avenue for mobile marketers to deliver highly relevant, engaging content and offers to precisely defined audiences. ← Oh, The Places You’ll Go – With SMoX!